Honoring the legacy of John F. Kennedy, President Barack Obama laid a wreath at the assassinated president's gravesite as a nation remembers that terrible day in Dallas a half-century ago Friday. Obama also recognized a group of distinguished Americans — including Bill Clinton and Oprah Winfrey — with the Presidential Medal of Freedom, an award created by Kennedy. Obama was joined at Arlington National Cemetery on Wednesday by Clinton, and each president held hands with Ethel Kennedy, widow of Robert F. Kennedy, as they climbed a flight of stairs to the burial site on a steep hillside overlooking the nation's capital. 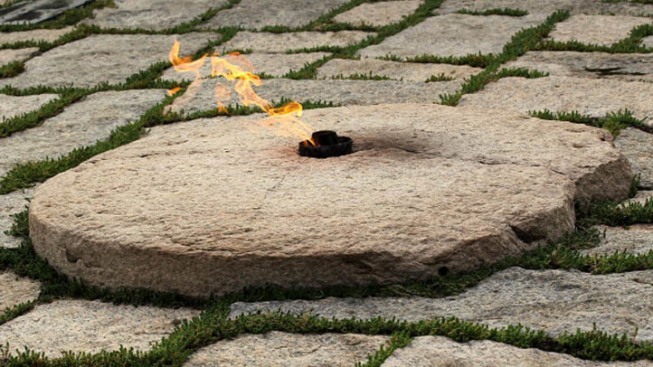 First lady Michelle Obama and former Secretary of State Hillary Rodham Clinton helped their husbands place a large wreath of white flowers in front of the roped-off gravesite of America's 35th president, which is marked by an ever-burning flame. Both couples placed their hands over their hearts as taps sounded near a U.S. flag at half-staff before greeting Kennedy relatives, including some who arrived in Obama's motorcade. Obama continued to lionize the slain president Wednesday evening at a dinner at the Smithsonian's National Museum of American History in honor of the medal's recipients. He said Kennedy stays in America's imagination not because he was assassinated, but because he embodied the character of the people he led. Kennedy was defiant in the face of impossible odds, he said, and determined to make the world anew. At the awards ceremony Wednesday morning, Obama said a few words about each recipient. Of Clinton, he said the Arkansas Democrat's presidency marked just the start of his work to make the world a better place, crediting his post-presidency humanitarian efforts as helping to save or improve the lives of millions worldwide. "I'm grateful, Bill, as well, for the advice and counsel that you've offered me, on and off the golf course," Obama said to chuckles. Obama said the late Sally Ride, the first American woman in space, didn't just break the stratospheric glass ceiling. "She blasted right through it," becoming a role model for young girls, he said. "You can't be what you can't see," Obama said. "Today our daughters, including Malia and Sasha, can set their sights a little bit higher because Sally Ride showed them the way." Receiving the award for Ride, who died last year, was Tam O'Shaughnessy, who was introduced as Ride's life partner. The president made a point of highlighting those who had overcome additional obstacles and stigmatization because they are gay, black, female or Asian. He noted that early in her career, Oprah Winfrey's bosses suggested she change her name to something more relatable. On Friday's assassination anniversary, Obama plans to meet privately at the White House with leaders and volunteers from the Peace Corps program, also established by Kennedy. The Clintons' presence at Kennedy's gravesite was sure to spark speculation about whether Obama has a favorite in the 2016 race to succeed him. Every move by the former secretary of state is being scrutinized for signs of whether she'll run. Vice President Joe Biden, another potential candidate, attended only the White House ceremony.